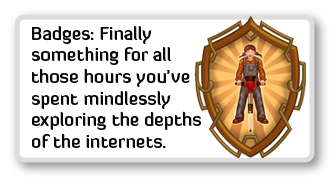 The Passive Multiplayer Online Game (later called NetherNet) did a good job of digitising experience points and merit badges via a firefox plugin for general web browsing. I’d like a something that would work for education across more than one web platform for tracking exercises and tasks completed. I imagine a list of tasks, and ’embed’ code for each task, that could be added to work while it is being created and act as a call back to the system to update what had been completed in someone’s todo list. A tutor log-in or peer voting layer would allow for feedback and confirmation of completion to be added within whatever page the badge was embedded. A QR-code generator could allow badges to be added to physical work, again to allow comments to be added directly.